Modelling of Engineering Materials presents the background that is necessary to understand the mathematical models that govern the mechanical response of engineering materials. The book provides the basics of continuum mechanics and helps the reader to use them to understand the development of nonlinear material response of solids and fluids used in engineering applications. A brief review of simplistic and linear models used to characterize the mechanical response of materials is presented. This is followed by a description of models that characterize the nonlinear response of solids and fluids from first principles. Emphasis is given to popular models that characterize the nonlinear response of materials. 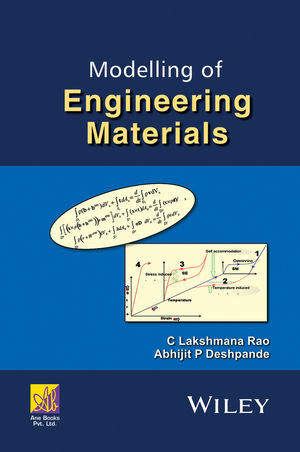 The book also presents case studies of materials, where a comprehensive discussion of material characterization, experimental techniques and constitutive model development, is presented. Common principles that govern material response of both solids and fluids within a unified framework are outlined. Mechanical response in the presence of non-mechanical fields such as thermal and electrical fields applied to special materials such as shape memory materials and piezoelectric materials is also explained within the same framework. C. Lakshmana Rao is a Professor in the Department of Applied Mechanics at Indina Institute of Technology (IIT) Madras, India. He obtained his B.Tech and MS from IIT Madras and Sc.D. from Massachusetts Institute of Technology. He teaches courses on continuum mechanics, numerical modeling, fracture mechanics and mechanics of materials. His research interests include modeling of failure in brittle materials, buckling control using smart materials and ballistic impact mechanics. Abhijit P. Deshpande is a Professor in the Department of Chemical Engineering at IIT Madras, India. He obtained his B.Tech from IIT Bombay, M.S. from the University of Pittsburgh and Ph.D. from the University of Washington. He teaches courses on continuum mechanics, polymer rheology, momentum transfer and thermodynamics. His research interests include polymer rheology, flow visualization, ionically conducting polymers and polymeric composites.